Most low-alcohol or non-alcoholic beers tend to be thinnish attempts at lager, or in Germany maybe Hefeweizen. Some of the better ones are just about tolerable, but others have a weird soapy note (hello Beck’s Blue). Then there’s Brewdog’s Nanny State, which ain’t bad at all, but you really need a bit more alcohol to carry that much hoppiness. 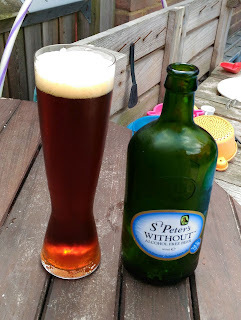 So it’s a bit of a surprise to realise that I’ve drunk not one but three non-alcoholic ales in the last week, and all were remarkably palatable! Having mostly just seen non-alcoholic lagers before, both in the UK and Germany, the first surprise was how dark it poured and the second was how toasty it smelled. It had body too – not heavy, but not thin either. If you’ve ever tried a malt drink or malt beer, it’s like a roasty one of those, but with a light peppery bitterness – and thankfully without their sometimes-gross sweetness. Instead it is more dry-sweet, with burnt caramel and malty wort notes. A little unusual but very drinkable. It’s the result, says the brewery, of “a complex proprietary process involving both attenuated fermentation and the stripping out of residual alcohol” – if I’ve understood rightly, that means they ferment it as low-alcohol and then remove what little alcohol there is. 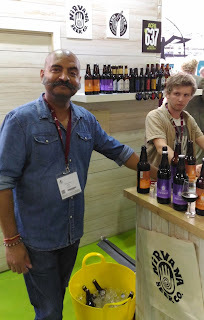 Then at the Imbibe drinks trade fair last week, I was introduced to Leyton-based Nirvana Brewery, one of two recent start-ups I know of that specialise in low and non-alcoholic beers. Co-founder Steve Dass explained that they started as home-brewers, and learnt from scratch how to brew non-alcoholic beers. Now they’ve acquired a normal 10 barrel brewkit and gone commercial, not just with an alcohol-free Pale Ale called Tantra but also an alcohol-free ‘Stout’ called Kosmic. “We’re trying to put a bit of body in – a bit of malt. Too many non-alcoholic beers are a bit thin, even the good German lagers,” Steve agreed. He said they’ve also done some work on 0.5% and 1% beers, but “we won’t go higher.” As far as the brewing process he was cagey, saying only that they use different yeasts and malts from most brewers. Both his beers were quite light bodied, yet carried their flavour well. Tantra was very malty on the nose with lots of Ovaltiney notes, in the body the maltiness was dry-sweet and it’s lightly hoppy. Kosmic definitely looked the part – near-black with a beige crema – and while it’s too light to really be called a Stout, it had pleasing notes of treacle tart and raisins. Is it a coincidence, I wonder, that the other low-alcohol start-up in London, Big Drop Brewing, also started with a Pale Ale and a Stout? I’ve not tried these 0.5% beers yet, but I will when I get the chance. In the meantime, I now know that there are decent low or alcohol-free options out there, not just sickly sodas and malt drinks, or weedy 0.5% lagers! I meant to comment on this post a couple of weeks ago, as my wife and I attended a garden party where driving was the only viable option. I took a couple of alcohol-free German wheat beers along to the function; one was produced by Erdinger which I have had before, whilst the other was from Franziskaner. Now I am not normally a fan of German Weissbiers, but both these examples were quite drinkable, and streets ahead of the usual alcohol-free beers. The clove and banana-like esters, probably masked the flavour missing from the lack of alcohol. I wouldn’t fancy a whole session on these beers, but perhaps this is the way forward? ps. I had a hangover-like headache the following morning, which was a bit of a bummer! I don't know about the headache, but NA beers seem to be much more common in Germany. I believe it's partly down to the technical training that you have to get to call yourself a brewer, as this includes the production of NA drinks. Plus they're generally more accepted - you even see the NA Hefes advertised as isotonic sports drinks! Last year, on holiday, my wife, who doesn't drink, enjoyed a couple of half litres of alcohol-free beer in a Regensburg beer garden. As you say, NA beers are pretty common in Germany. Btw the Erdinger Weissbier I bought the other day, was actually described on the label as an isotonic sports drink.